St Vincents Road, outside Nudgee Cemetery. Nudgee can be accessed by train, with its train station providing Shorncliffe services and train services to the city. The name Nudgee is believed to be derived from the Indigenous (Oondumbi/Undumbi clan) words N'mugi or Na'dah, meaning the 'home of wild ducks'. 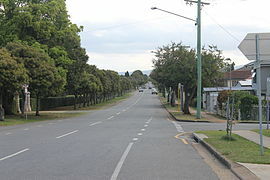 In the 2011 census, Nudgee recorded a population of 2,856 people; 53% female and 47% male. The median age of the Nudgee population was 37 years of age, which was the same as the national median. Children aged under 15 years made up 19.8% of the population and people aged 65 years and over made up 15.4% of the population. 78% of people living in Nudgee were born in Australia, compared to the national average of 69.8%; the next most common countries of birth were New Zealand 3.6%, England 2.5%, India 2.3%, Philippines 1.8%, Ireland 0.9%. 88.1% of people spoke only English at home; the next most popular languages were 1.3% Filipino, 1.1% Punjabi, 0.6% Tagalog, 0.6% German, 0.6% Mandarin. Nudgee railway station provides access to regular Queensland Rail City network services to Brisbane and Shorncliffe. In the 2011 census, 18.0% of employed people traveled to work on public transport and 60.3% by car (either as driver or as passenger). Nudgee will be amongst the first suburbs in the Brisbane Area to be connected to the National Broadband Network, with services predicted to be available in November 2013. Nudgee's upcoming fibre network will be serviced by the 4NDG fibre serving area. Nudgee cemetery is located on St Vincents Road and is operated by the Roman Catholic Archdiocese of Brisbane. It is the largest private cemetery in Brisbane. Although most people buried there are Catholics, non-Catholics can also be buried there. ^ Australian Bureau of Statistics (27 June 2017). 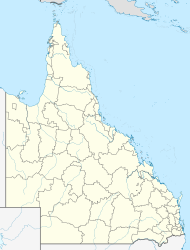 "Nudgee (State Suburb)". 2016 Census QuickStats. Retrieved 14 January 2018. ^ "mynbn.info NBN Status". Retrieved 21 August 2013. ^ "Welcome to Nudgee Cemetery & Crematorium". Retrieved 8 November 2014. "Nudgee". Our Brisbane. Brisbane City Council. Archived from the original on 14 September 2007.